I still can’t believe that it’s even a thing. Who would have thought that we would end up being Canada’s Firm of the Future, with the possibility that we could be Intuit’s® Global Firm of the Future? Certainly not me. Definitely not even in the remote recesses of my mind, when I took the plunge into self-employment all of those years ago. At the time, it was fear, and sleepless nights, and “what if this doesn’t work” conversations. The journey certainly wasn’t an uphill trajectory all the way. There were a lot of peaks and valleys. Some years more valleys than peaks. So, I guess that is why I wanted to write this post. To give hope. To tell those out there, who are questioning whether to take that leap of faith, or hang up that sign, that there is hope. That anything is possible. 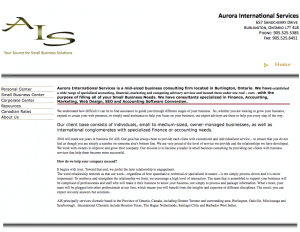 So here it goes … AIS Solutions started out as Aurora International Services in the spare bedroom of my semi-detached house in Toronto, Ontario, Canada, in 2000. The name arose because I thought it made me sound bigger, and at the time, if your name was included in your business name, you didn’t have to spend the $60 to formally register the name, so I was also being cheap. No grand aspirations of a business at the time; I just didn’t like how much time my daughter was spending in daycare, and felt like I was missing out on so much. I started really small. Dipping my toe in the water to see what happened, but not really committing to anything, and not really putting anything on the line. Fast forward one year, when fate intervened and sent some signals my way. I went through a messy divorce and became a single mom. The company I was working for at the time was purchased by an international conglomerate and being relocated to the U.S. 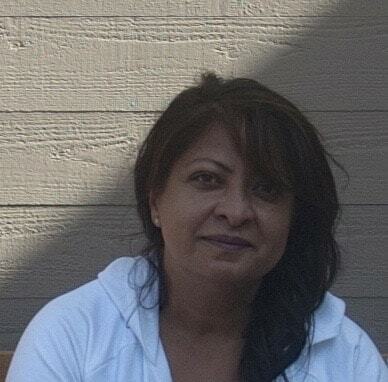 It was still too close to 9/11 and the colour of my skin was not conducive to living in the U.S. So, it was do or die. Either I throw myself into this venture and give myself the freedom to spend time with my daughter, or I pound the pavement and find another job. Don’t ask me why I chose the former. I certainly didn’t think of myself as an entrepreneur. I didn’t view myself as a leader of any sort, or a visionary. I simply was trying to have a little control of my life and my time, and be able to play with my daughter and read her stories whenever she wanted. I gave myself six months. That was about what I had in funds that I could survive, if I didn’t have a single client or make a dime. If, after the six months, I couldn’t support myself and my daughter, I told myself that I would go back into the corporate world. My first client ended up being my former employer. My second client was in Barbados, as a spin off from my first client. My third client was my real estate agent. My fourth client was her friend. And, then it just morphed from there. My clients grew from word of mouth, and I pretty much performed any service that was related to finance. Taxes, accounting department support, year-end assistance, bookkeeping, accounting and accounting system conversions. If there was a job that was related to numbers in any way, shape or form, I took it. I worked in the morning before my daughter woke up, played with her in the mornings, dropped her off for a while at daycare and then worked again after she went to bed. There were long days and nights, but I was energized. I had control of my life, and had clients that allowed me to pay my bills, keep a roof over my head and put food on the table. I had no website until 2003. And, when I did create it, it was brutal. Literally. I designed my own logo and my cheesy tag line was “Illuminating your path to Financial Success.” Get it … Aurora … Aurora Borealis … Northern Lights … like I said … cheesy. But, the website was all mine and I was beyond excited. I got to pick the fonts and colours, and put my message out there for the world to see! I couldn’t afford to hire anyone to build it, so with the help of a friend, I learned the basics, and then spent my nights building my website. Just for your amusement, here is what one of the pages looked like (because I save absolutely everything). The box in the corner was a spinning blue globe. Fast forward another two years to 2005, where I made another shift and started hiring subcontractors to work for me. By now, I had moved my business to Burlington, Ontario, to be with Steve (that’s a whole other blog post), and was finding that there was too much disparity for my small business clients in what was passing as bookkeeping. So, I started offering services of bookkeeping and CFO services as a package. The business was still home based, all services were onsite at the clients and staff meetings were around my dining table. But, I rebranded and got a new fancy logo and website. Again, all low budget, do it yourself. But, you can see where the name for AIS is being born. My business continued this way until 2010. Me working all the time, while having an office in my home. Getting up in the morning and heading to the office. Going to the office before going to bed at night. Work/life balance was a myth. It didn’t exist, and there was no separation for me. I didn’t have the personality or the discipline to ever turn it off. Steve was the one who convinced me that things needed to change, and that I needed to be able to separate some of my home and work life. In March of 2010, I took the plunge and rented some office space. Lots of sleepless nights as I fundamentally shifted my business model and took on overhead for the first time. We borrowed against our house and opened our doors. We introduced AIS Cloud, which provided hosted bookkeeping services with any accounting software you were using. I hired full-time staff, and all of the services shifted from on-site at my clients to this very expensive infrastructure that we invested in to create secure channels for our clients financial information. VPN Networks, Firewall boxes and Terminal Servers … we had it all. But, more than anything, it was the birth of AIS Solutions. 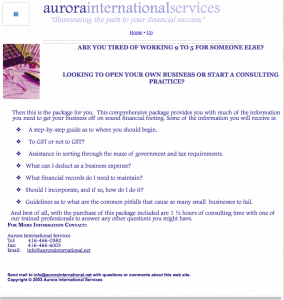 Aurora International Services disappeared, and we created this exciting new business. Steve had always been my partner with Aurora International. My sounding board, my voice of reason, my biggest ally and my support system, all while still running his own business. But, in 2010, we formalized that participation and he joined AIS Solutions part-time to help build this conglomerate that would shake up the bookkeeping world. We also rebranded once again, and you probably will recognize the logo now. More important than the new logo and new name was the change in how we did things. I actually started to want to create a business. Don’t get me wrong, there was more fear now than ever before. I had gotten very comfortable with my consulting gigs from my house. I hadn’t done anything new or exciting in quite some time, but to be honest, what I had created for myself was a job. And, I was bored. I had nothing in place that could run without me. When I wasn’t working, I wasn’t really getting paid. The bookkeeping services we were providing varied from client to client because it was all driven by how my subcontractors did things. 2011, and the hiring of our coach – Dan Holstein from ActionCoach – fundamentally shifted all of that on its axis. Steve and I hadn’t taken a real vacation in years, and when we tried to get away, we were always connected, working, and answering emails and phone calls. And, we were stuck. The reason that I had started the business for myself all those years ago – so that I could be there for my daughter – had gotten lost along the way. I was working more hours than I ever did when she was little, and there was no time to stop and just BE with her. Sure, she was in private school and lived in a beautiful house. We had nice cars and nice clothes, and went out for nice dinners. But, we were quickly losing our connection and our reality. Hiring Dan may sound like we did it because we were smart, but quite honestly, it was done out of desperation. Something either needed to change, or we needed to close the doors of AIS, because the life and business we had created for ourselves wasn’t sustainable. And, it was scary. We didn’t have the money to pay for the coach, so we dipped into our retirement savings plans to pay for him. Already going through our minds was whether we were going to close the doors of AIS, which meant no income coming in, and taking a hit for everything that we had put into the business and still hadn’t paid off, and here we were taking out of our nest egg to put into the business. But, it really was do or die. Steve and I went from never taking a vacation to taking a two-week vacation, where we were completely disconnected in 2012. Yup. Not a single phone call or email to the office or the clients. And, guess what, the business still ran. The clients got looked after, and the business was still standing when we returned. Not only were we relieved (because believe me, there was some worry), but more than anything else, it also made our team stronger, as they all rallied together to solve whatever challenge arose in our absence. I’m not going to tell you that it has all run smoothly from 2011 to now because I would be lying. There were days that we seriously thought about closing the doors. That, perhaps, it wasn’t all worth putting everything on the line. In 2015, we were approached by a large accounting firm to purchase AIS Solutions. And, we were tempted. But, at the end of the day, it came down to being proud of what we have built, and Steve and I recognizing that we are completely unemployable. So, instead of selling, we decided to double down. At the end of 2015, Steve joined AIS Solutions full time, and we entered into another exciting phase of our business journey – the creation of Kninja. Kninja is our way of giving back – giving back to this bookkeeping industry of mostly solo home-based businesses that have the same struggles that we did. It is our way of sharing all of the mistakes that we’ve made so that perhaps others can accelerate their path, and not have the same low valleys that we did over the years. Since the announcement of being named Canada’s Firm of the Future, I’ve had lots of people reach out to me to say that they aspire to be like our firm. They say how awesome they think our business is, and all that we’ve accomplished. I guess that was the reason for this very long-winded blog post … to share with you all that it isn’t easy. It is scary. It is a bumpy road. There are days and months and years when you just want to slam the doors shut and hide in a corner. But, hang in. There is light at the end of the tunnel. It is all possible. Don’t give up because, quite honestly, it is worth the ride.